Watermark Builders is hard at work finishing up their Showcase Home for the Bellaire New Home Showcase, May 12th / 13th and 19th / 20th. Please come see this lovely Mediterranean styled home with a contemporary design. 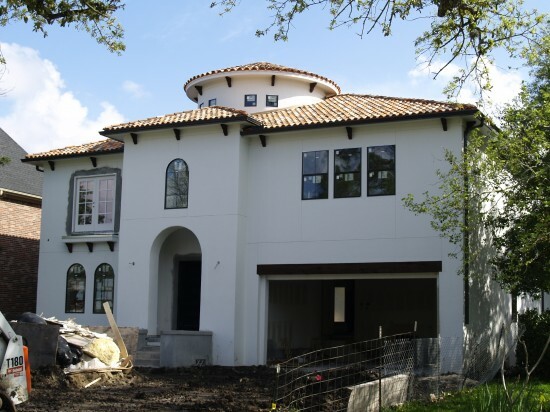 This custom built home features an authentic clay tile roof with a stucco exterior. Watermark Builders is always innovating and adapting to new green technologies. This new built home in Bellaire Texas is no exception, as Watermark Builders has installed a new Hybrid Solar assisted air-conditioning system by Solarcool. This latest Air-Conditioning technology saves up to 40% on cooling bills. Coupled with Foam insulation throughout saves an additional 30% to 40% on your heating and cooling. That’s great for your pocket-book and great for the environment. As with all Watermark Home, an eye for detail and luxury permeates throughout. This Houston Texas Showcase Home features a dedicated media room, Walnut wood floors, and Italian made Okite slab counter-tops that are stronger than granite and a green alternative. Watermark Builders is please to have built this home architected by Don Purser with Purser Architectural Designs. Be sure to come out during the Bellaire New Home Showcase and see this beautiful home in person. And for those of you who can’t come to Houston Texas to see it, we’ll post gallery pictures of this beautiful new home after the show. This entry was posted in Gallery and tagged elevations, front yard, showcase home, under construction by Watermark. Bookmark the permalink.